Hopefully I’ll be able to explain this one sufficiently. The notes sang from the piano with a practiced pride. To everyone else this was a cute little performance, but the little girl’s expression made it clear that it was so much more for her—she got to play the piano with mommy in front of everyone. Why is this “homeschool moment” such a big deal? Honestly, I’m not completely sure, but watching it happen I know that it was. Maybe it has something to do with the hours of practice that went into the twelve or so simple notes of the song. 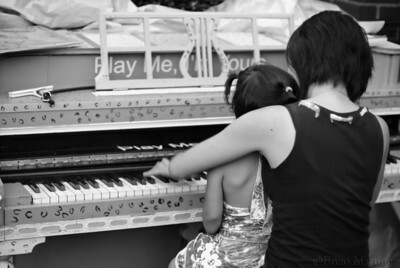 Or maybe it was the modest act of a mom allowing her daughter to join in making music. Or maybe it was the living picture of the song’s few words brought to life by a little set of hands next to a bigger set of hands playing, “Oh, how I love Jesus” over and over. Whatever the case, as the mom deliberately slowed her pace so her daughter could take the lead, “Oh how I love Jesus, because he first loved me,” I knew I was witnessing one of the most beautiful pictures of Christian education I’ve seen in a long time.